Norway has successfully operated a public Search and Rescue Helicopter Service for more than 35 years. The Norwegian rescue responsibility area is huge where the ocean area is 6 times larger than the Norwegian mainland. In the harsh and sometimes hostile climate with the rugged Norwegian topography and extensive outdoor activities inland, in addition to the fisheries and offshore industry, the SAR service has proven its value as a safety measure for the society. The Sea King helicopters have been in service from the very beginning, and are now due for replacement. The planned replacement will take place by 2015. 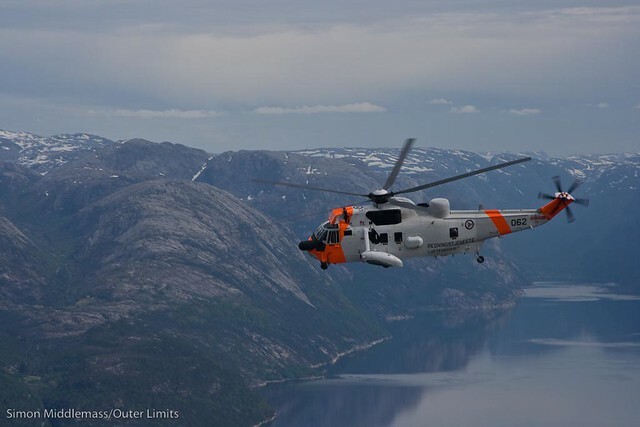 Norway is planning to acquire 10 – 12 new all weather search and rescue helicopters. Iceland is also looking for new SAR helicopters due to the withdrawal of the American support in 2006. Iceland has the same natural challenges as Norway with high demands on the search and rescue services. Iceland is planning to acquire 3 new all weather search and rescue helicopters. Based on this common requirement, Iceland and Norway have entered into an agreement to consider a joint procurement process. Both countries consider a multi-mission helicopter capability to be cost-effective for society. In certain situations, the search and rescue helicopters’ ability to operate in hostile weather make them particularly well suited, or indeed the only option, for an air ambulance service. Therefore, the need for ambulance services will continue to be a fundamental requirement also in the future. Norway has established a project team, the NAWSARH project (the Project), which will run the procedures for the future acquisition, based on future decision in accordance with Norwegian Quality Assurance regime for major investments. Iceland has joined the Project. There are high level liaison and coordination activities between Iceland and Norway. Rescue services can be defined as the publicly organised action that is effectuated to rescue people from death or injury following accidents or other dangerous situations both at sea and on land, and which are not maintained by specific organs or as a result of specific actions. The Search and Rescue Helicopter Service is a dedicated resource within the publicly organised Search and Rescue Service, fully financed on the national budget and part of the Ministry of Justice’s portfolio. The Search and Rescue Services is operated by the 330 squadron of the Defence. The Icelandic Search and Rescue Region (SRR) is about 1.9 million km2, of which about 95% is over the adjacent North Atlantic sea areas. 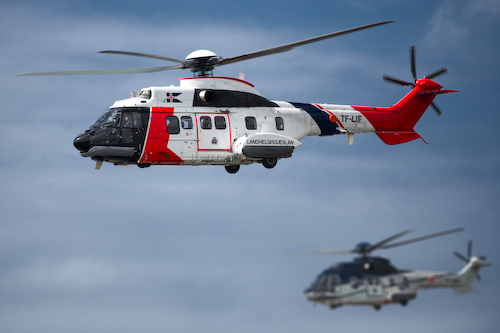 In Iceland the Ministry of Justice is responsible for Search and Rescue services over land and sea areas, and has for many years assigned the Icelandic Coast Guard the task of operating SAR aircraft, based at Reykjavík Airport. The ICG is currently operating for this purpose four Eurocopter SAR-helicopters, three Super Pumas and one Dauphin. Additionally, the ICG operates one Fokker F-27 maritime surveillance aircraft, which will be replaced my mid-2009 by a new Bombardier DHC-8-300 aircraft fitted with advanced surveillance equipment. The operating environment in Iceland and Norway, and their associated Search and Rescue Regions, is considered to be very similar. Both of these North Atlantic nations have similar ideas about the required mission capability and equipment status of new long-range SAR-helicopters. Iceland has a firm requirement to purchase three new long-range state-of-the art SAR-helicopters. Thus, the Icelandic Ministry of Justice is formally participating in the ongoing Request for Information (RFI) process, and other preparatory processses, currently being planned by the Norwegian NAWSARH-project in Stavanger. Provide year-round safety for people in the SAR region at sea, in inaccessible terrain, and in difficult situations where other resources are insufficient. With the aim of keeping minimum of one serviceable helicopter per base 24 hours a day all year round, with a target of 100% readiness. The reaction time is 15 minutes. The availability requirements will be measured at the interface between the Turnkey provision and the equipment and services performed in-house (by the Operator). The main objective is to enable the Operator to obtain the readiness targets, however taking into account life cycle cost effects. The final combination of the number of helicopters, availability requirements, and maintenance and logistics services, will hence be subject to negotiations. To continue the present established practice to conduct air ambulance services, where the health service’s own helicopters are unsuitable. To carry out other missions of public importance (military missions, support to special police missions, specialised fire fighting, emergency relief, environmental protection, and other missions of public interest aimed at protecting assets or the environment). The procurement will seek out a Turnkey provider, with only one contractual interface between the Ministry and the chosen provider. Some assets and services will be made available to the Bidders for incorporation in the Turnkey solution if considered appropriate by the Bidder. with a purchase option of two more helicopters. Iceland intends to procure, as far as it is feasible, the same helicopters as Norway, thereby achieving efficiency and economies of scale. Iceland will perform line and base maintenance in-house, and acquire other necessary services. It is the Ministry’s objective that the procurement shall be open to both military and civil certified helicopters, and military and civil registration. It is thus the Ministry’s objective that the Candidate may freely choose what he considers most advantageous in order to meet the Ministry’s operational, functional and technical requirements. The intended helicopter shall prove evidence that it will hold a civil EASA type certificate or military qualification from recognised authority at the latest when preferred bidder is selected. The Ministry intention is not to close the question of helicopter register until the time of selecting the preferred bidder, based on his best overall offer. Please note that in order to allow a change in the future register (i.e. to a civil register) it is required that operational flexibility in relation to SAR and air ambulance operations is upheld. Whether this is obtainable is pending clarifications from the MoD, CAA-N and EASA. Hence, the Ministry reserves the right to revisit the required regulatory regime as necessary due to EASAs response, or if otherwise required to do so in order to comply with the prerequisite of operational flexibility. –due to any other presently unforeseen or uncontrollable circumstance. The Options shall be valid for a maximum period equalling the length of the maintenance and logistics services. The demonstration has been conducted in line with the RFI, in the areas mission planning, range demonstration, search capabilities, autohover and pickup, handling, navigation, downwash, exhaust ingestion in cabin and cabin capacity. The project demonstration team consisted of a whole Sea King crew from the 330sqd as well as expert consultants from civil industry and participants from Iceland. Airbus Helicopteros se ha asegurado un H225 SAR adicional para la flota de la Guardia Costera Japonesa, elevando el total a 10 unidades. La Guardia Costera Japonsea opera tres AS332 y cinco H225. El helicóptero de Salvamento Marítimo Helimer 401 evacuó a un tripulante enfermo de un buque que se encontraba a unas 110 millas de A Coruña. El helicóptero, el primero de 16, había sido entregado justo hace una semana. El accidente ocurrió durante una prueba en tierra. No hay heridos.